Julia Scheeres stumbles across these signs along the side of a cornfield while out biking with her adopted brother David. It’s the mid-1980s, they’re sixteen years old, and have just moved to rural Indiana, a landscape of cottonwood trees and trailer parks–and a racism neither of them is prepared for. While Julia is white, her close relationship with David, who’s black, makes them both outcasts. At home, a distant mother–more involved with her church’s missionaries than with her own children–and a violent father only compound their problems. When the day comes that high-school hormones, racist brutality, and a deep-seated restlessness prove too much to bear, their parents’ solution is reform school–in the Dominican Republic. In this riveting memoir, first-time author Scheeres takes us with her from the Midwest to a place beyond imagining. Surrounded by natural beauty, the Escuela Caribe is nonetheless characterized by a disciplinary regime that demands its teens repent for their sins under boot-camp conditions. Julia and David’s striving to make it through is told here with startling immediacy, extreme candor, and not an ounce of malice. After reading A Thousand Lives a couple of years ago (also written by Scheeres), Jesus Land was on my radar, but it wasn’t until recently that I decided to listen to it. It’s definitely one of the more interesting books I’ve read in a while. I really felt for Scheeres, who really had some horrible parents. Her dad was largely absent, due to being a doctor, but violent when he is around. And her mother is much more interested in religion than raising children. Their home seemed more like a compound (largely due to the intercoms installed in the house) rather than a home, and her parents seem like the sort of people who would adopt 2 African-American boys to show how Christian they are, rather than because they really want to. As for their biological children? We only see Julia (and not her other siblings) but their idea of parenting is to provide the basic necessities and no affection or caring. They’re pretty distant and detached and unfeeling. Still, I do sort of admire them for adopting when it would have been easy not to. And while not really presented in the book, they may have started out with the best of intentions before things went terribly wrong. The fact that they would get rid of David’s things days after he goes to reform school at the age of 16, and some of the comments they made after his early, tragic death at the age of 20 were just horrible. You do have to wonder if their relationships with Julia’s older siblings were different, because they seemed pretty indifferent to Julia, David and Jerome. It made me so sad, and so angry on their behalf. I do have trouble believing that rural Indiana in the 70’s/80’s is as bad as seen in the book, and there is a part of me that wonders if maybe parts of it were embellished. There were so many times when it seemed like the book was set much earlier, and it was always jarring to hear the author reference Duran Duran or Reagan, because it seemed like the book happened several decades earlier than it did. And the school they had to go to! I can’t believe a school like that exists, and yet I’m not surprised that such a school would exist. The things that they had to do- asking permission for everything, including sitting up or down or leaving or entering a room, or using a machete to whack weeds or carrying rocks back and forth for no reason. The reasons why the kids ended up at the school in the first place seemed to be very over-exaggerated and twisted. Julia drinking at a party? It means she’s an alcoholic. Julia’s brother Jerome ending up in jail? Julia and David will be kept at the school for as long as necessary, even if they’re legally adults, just to make sure that they don’t end up going down the same path. Here’s where one of my reservations about the book comes in. I mean, Julia does make quite a few mistakes but doesn’t seem to show any responsibility for her actions. Granted, the book ends when she leaves Escuela Caribe, plus an epilogue that gives a brief overview of her life and David’s after leaving the school. Even in the epilogue, she doesn’t reflect on why she ended up in so much trouble. It doesn’t make everything else that happened okay, but I do wish we saw even a hint of owning up to her mistakes. Another thing that I thought was interesting was how one-sided her account seemed. Every adult was horrible and cruel and stupid, and I’m really skeptical of that. As much as I appreciate her experience, and how horrible some of these reform schools are, and the racism she had to deal with just because of her adopted brothers, and how horrible it is to use religion (particularly Christianity) to abuse kids, there’s also something this memoir that didn’t quite sit right with me. It wasn’t as reflective as I thought, and while I know it’s Scheeres memoir, something about it seemed very one-sided to me. 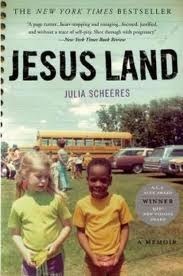 Parts of Jesus Land made me so angry and so sad. While parts of it were interesting (especially when she was at Escuela Caribe), overall, something about it seemed off to me. I did love the relationship she had with her brother David, and how they’d do almost anything for each other. Jesus Land gets 3 stars.